BC26 - 6.0 X 3.5 X 1.0 mm. 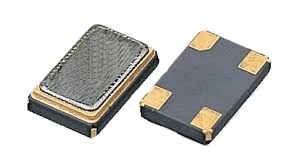 The BC26 crystal is an ultra miniature surface mount (SMD) ceramic package with size of 6.0x3.5x1.0mm. With its ceramic base and metal cover provides the durability and reliability necessary for strenuous processes like infrared and vapor phase reflow. Applications include PMCIA, wireless, automotive, communications and test equipment.